Features: hand carved violin with high gloss finish. The front board is made from spruce, makes a good full tone possible. The head and side board are made from maple, provides a good playability. The back board is made from flame maple which makes it looks exquisite. Steel-cored zinc ally strings, sound better and anti-oxidation. A padded case with inside foam and lint gives the best protection to the violin. Comes with case / rosin / cleaning cloth, better to meet your needs. 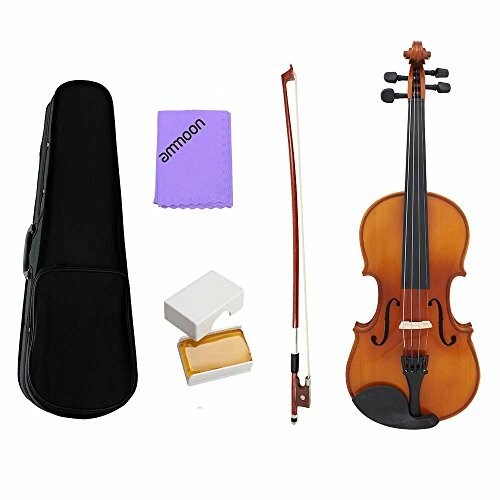 Specifications: brand: ammoon type：1/4 scroll: maple front board: spruce back board: flame maple side board: maple finger board: faux ebony string: steel & zinc alloy bow: arbor bow hair: horse tail item weight: 280g / 9.9in package size: 67 22 10.5cm / 26.4 8.7 4.1in package weight: 1040g / 2.3lbnote: before use, please rub some rosin onto the bow. Softly adjust the knob at the bottom of the bow to tighten it. Properly place the bridge, and gently rotate the tuning pegs to tighten the string. Package list: 1 violin, 1 bow, 1 violin case, 1 rosin, 1 cleaning cloth.